I prefer tea. 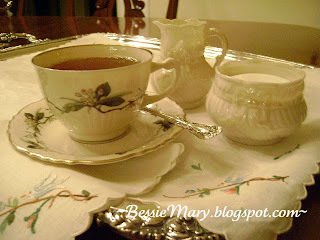 Delicate china, accessorized with vintage sterling, makes me swoon. Embroidery is a passion. All of them together? Nothing better! This is the china of my childhood. It reminds me of holidays, birthdays and my mother's delicious cooking. The sterling spoon is from my grandmother's silver collection, and evokes even more fond memories of family gatherings. 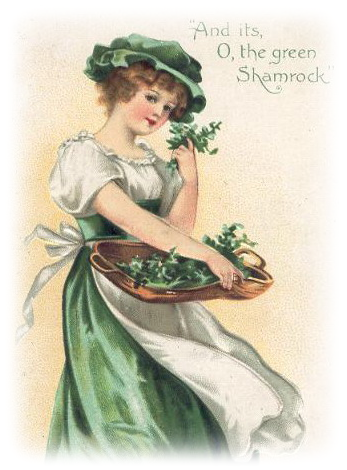 As a nod to the approaching St. Paddy's Day, a charming Belleek China sugar and creamer. It once was cherished and used by my dear mother-in-law. Underneath it all, a tea tray cloth and matching napkin which I purchased several years ago on a shopping spree at a local antique mall. I have no idea of its origin or history. It simply made me smile, which almost always culminates in "Sold"! The cheerful colors and sweet birds enchanted me from the first moment. It was only upon closer observation, that I realized almost every stitch on the entire cloth and matching napkin was a chain stitch. Chain stitch is one of the oldest and most basic of embroidery stitches. It is the foundation for many other stitches. Here it stands alone and creates beauty by itself. 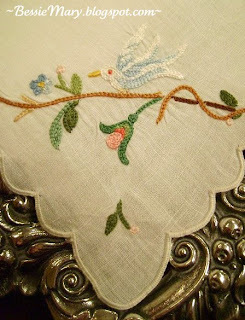 French knots form the birds' eyes, and a sprinkling of satin stitches form flower centers. 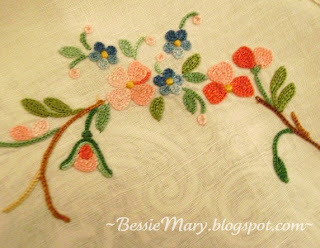 Otherwise, the entire design is a series of teeny tiny chain stitches, stitched closely together as a filling stitch. This type of chain stitch is sometimes referred to as point de chainette. Turning the cloth to the reverse, we see a series of tiny straight stitches -- or, we would if my photography skills were top notch! 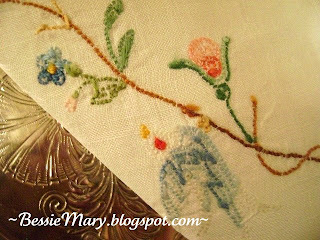 This is a sign that the embroidery was created with needle and thread, instead of the use of a tambour hook -- another means of incorporating chain stitch into a design as a filling stitch. In tambour work, the stitches on the reverse would not show up as separate stitches. The fabric of the tray cloth is a very fine ecru linen. I love how the etching of the silver tray beneath shadows through, almost becoming a part of the design. This is my entry in Show and Share Friday, hosted by Cindy of My Romantic Home. 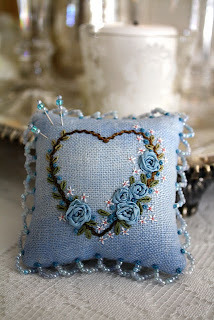 Here is her entry: an exquisite pin cushion in a delightful shade of blue! Join Cindy and others here for Show and Share Friday! Your table looks very nice. I love the stitched table cloths. Very delicate and nice. I'm a lover of tea myself....your photo is quite beautiful with the delicate china and the vintage sterling and embroidery....makes me want to get in the kitchen and make myself a cup! How pretty and serene. So pretty you could even drink the kool aid from it. LOL Beautiful. Love the tea cloth. Very pretty I love the sugar & creamer. I'm following you so I don't miss a thing.